Margie Lancaster has traveled home to Dare Valley with a broken heart. Her time with Evan Michaels had to end since the opening of her new bakery is just around the corner. But Evan isn't finished with his Pocket Venus. 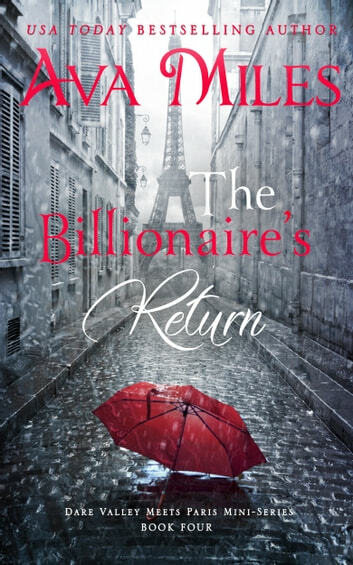 He returns to Dare Valley in all his billionaire alpha glory determined to find a way to keep Margie and the true love between them—even after all the secrets he kept from her. As he attempts to forge a life for himself in the small town, can Margie overcome her tragic past enough to find her happily ever after with Evan? And can Evan discover his true happiness again by re-inventing himself before all the money and glory got in the way? "I received an eBook copy from the publisher for the purpose of an honest review. I was not compensated for this review: all conclusions are my own." This is the final book in the mini series and Margie and Evan have had their ups and downs its now up to Evan to prove that to Margie that his money is not the most important thing in the world, and he returns to Dare Valley to win her back. Margie has finally got her bakery up and running and is trying to get over Evan but her heart is still his. Absolutely loved this mini series to nice to only have to wait 1 week between each book being released. This is the fourth and final installment of Ava Miles Dare Valley Meets Paris mini-series. Following the heartbreaking end of the 3rd book, Margie and Evan are both trying to heal, move on, not speaking, although their hearts are devastated. Margie's rejection has deeply hurt Evan; and Evan's rejections of Margie's pleas to understand her reasons has deeply affected Margie who, although finding professional success and surrounded by friends and her full life in Dare Valley, is a bit of an empty shell of who she was. Both are shaken - For Margie, although in love, couldn't understand how they could make their life together. Evan, with the help of Chase (who should likely get his own story! ), is able to understand that falling in love has helped shape him into who he should and can be, and returns to Dare Valley to offer Margie and himself their own happily ever after - which will look different than either imagined, and will be full of compromise but also love. Always nice to reach the happily ever after! *I received an eBook copy from the publisher for the purpose of an honest review. I was not compensated for this review: all conclusions are my own. Thrilling Conclusion to this wonderful series! In the conclusion to Margie and Evan's story, we return to Dare Valley. I loved this series so much and this final installment was everything and more that it should be. The pure heartache and anguish they endure along their way back to each other was so real. Devastated by her ending in Paris with Evan, Margie throws herself into her work. Not ever expecting to see Evan, she has reconciled to a life alone without her love. Evan has also thrown himself into his work. Not leaving his lab to even shave. What's the point if he can't have his heart with him. But Chase makes him see they may have a chance and he is willing to do anything to see if they can be together. When Evan shows up in Dare Valley for his new endeavor, Margie is stunned. And his relentless wooing wears her down. When her past is thrown in her face it brings back all the bad from her past and she once again pushes Evan away. Can these two ever overcome everything and be together? A fantastic finale to this mini series. Once again, Ava Miles brings us the magic she has brought us in the earlier volumes. From Dare Valley to Paris and now back to Dare Valley, the story of Evan and Margie continues. After wallowing in pity and burying himself in work after Margie rejects his proposal, Evan is now back at Dare Valley. I love this new Evan. His actions to show Margie that he could be happy with him even though he is a billionaire were so much more of a courtship than the actions he used to woo Margie in Paris. Evan's best friend Chase appears more in this volume and I really enjoyed his character. Hope that he will get his HEA too. Was really sad to come to the end of this mini-series. This is a series that you definitely do not want to miss. But do remember to start from the first story as it will be much more meaningful. ** I received an eBook copy from the publisher for the purpose of an honest review. I was not compensated for this review: all conclusions are my own.